On Monday I started work on BAA Bulletin #469, answered a stack of e-mails, made motel arrangements for the Morro Bay IPT–remember, I will go with one :), enjoyed an easy 60-length swim in sunshine, and took a short nap. This blog post, the 346th in a row, took about 1 1/2 hours to prepare. It was published from my home at Indian Lake Estates just after 5:15am. In the continuing good news department we filled one of the two remaining slots on the UK Puffins and Gannets IPT. A long-reaching telephoto zoom characterized by a sophisticated optical design and advanced image stabilization technologies, the Canon EF 100-400mm f/4.5-5.6L IS II USM lens is part of the esteemed L-series developed for full-frame EOS DSLRs. One fluorite element and one Super UD element have been incorporated into the lens’ construction, and both help to reduce aberrations and distortions throughout the zoom range in order to deliver notable clarity, image sharpness, and faithful color reproduction. An Air Sphere Coating has also been applied to lens elements in order to reduce lens flare and ghosting for more contrast-rich imagery. Benefitting the optical components of the lens, a four-stop effective Optical Image Stabilizer helps to minimize the appearance of camera shake and can be dedicated to different styles of shooting. Furthermore, a redeveloped rotation-type zoom ring pairs with an internal focusing mechanism, and an Ultrasonic Motor, to deliver quick and intuitive handling to benefit handheld shooting. Positioned as a versatile option for sports and wildlife photographers, this lens’ list of attributes make it a viable telephoto zoom for a variety of shooting applications. Telephoto zoom 100-400mm f/4.5-5.6 lens is compatible with full-frame EOS DSLRs, as well as APS-C sized sensors where it will provide a 35mm-equivalent focal length of 160-640mm. One fluorite element and one Super UD (Ultra Low Dispersion) element help to correct chromatic aberrations throughout the zoom range for a high degree of sharpness, clarity, and color accuracy. An Air Sphere Coating (ASC) has been applied to lens elements to reduce backlit flaring and ghosting for maintained light transmission and high contrast in strong lighting conditions. An Optical Image Stabilizer helps to minimize the appearance of camera shake by up to four shutter speed stops to better enable working in low-light conditions and with slower shutter speeds. Additionally, three dedicated image stabilization modes are available-Standard, Panning, and During Exposure Only-and can be selectively employed to suit a variety of types of shooting. An Ultrasonic Motor (USM), along with an internal focusing system, high-speed CPU, and optimized AF algorithms, are employed to deliver fast, precise, and near-silent autofocus performance. The rotation-type zoom ring offers precise adjustment between zoom positions, especially when shooting handheld, and a zoom torque adjustment ring enables easy setting of the zoom tension for personalized control. A weather-resistant design protects the lens from dust and moisture to enable its use in inclement conditions. Additionally, fluorine coatings have also been applied to the front and rear lens elements for further protection against fingerprints and smudging. Nine rounded diaphragm blades contribute to a pleasing out of focus quality that benefits the use of shallow depth of field and selective focus techniques. A redeveloped tripod collar can be attached or detached from the lens without having to remove the lens from the camera. You can pre-order your 100-400II by clicking here. A new Fluorine anti-smear coating is applied to the front and rear elements of the EF100-400mm f/4.5-5.6L IS II USM lens, on top of the anti-reflection multicoating layers. This new coating, which also appears on all L-series EF lenses released since 2010 as well as the Series III EF Extenders, is scratch-resistant as well as extremely oil-and water-repellent. It easily deflects these liquids so that they can be wiped off with a soft, clean, dry cloth with no need for lens cleaning solutions. The Fluorine coating on the new lenses is similar in composition to the Fluorine coatings found on the exterior surfaces of the LCD ClearView screens for EOS models released since 2009, as well as the surfaces of the anti-aliasing low-pass filters found on most EOS models equipped with the EOS Integrated Cleaning System. Canon’s Fluorine lens coating is completely transparent and neutral in terms of color balance, so its effects are expected to be completely beneficial to photographers using the new lenses and extenders. I learned on 11/16/14 from Chuck Westfall that the ET-83D lens hood does not fit the old lens and vice versa. It was announced only as a replacement. Under “Overview” it mentions the “included ET-83D lens hood.” Under the description of an apparently separate project, it states that this item is a replacement for the original hood included with the lens…. I have e-mailed Chuck Westfall and Rudy Winston at Canon and will report back once I hear from them and let everyone know what’s up. Though it does not mention it specifically that the new hood, whether included or not, will surely snap securely into place, unlike the lens hood on the original 1-4 which fell off the lens often, often without provocation. The Canon ET-83D Lens Hood is dedicated to the Canon EF 100-400mm f/4.5-5.6L IS II USM lens and helps to minimize flare by deflecting stray light from entering the lens. Its design incorporates a side window for easier adjustment of specialty rotating filters while the hood is in place. Additionally, the hood also provides additional protection to the lens from accidental impacts, bumps, and scratching. I used your general B&H link tonight and pre-ordered the new Canon 100-400 lens. I cancelled my Sigma Tele zoom order when this lens was announced. I just hope I can get it before I leave for New Zealand on Dec 15th. Does anyone know the estimated ship date? Let’s not forget that the 7D II was originally not supposed to ship until the end of November. Not to mention how great the 100-400II will be with a 7d Mark II…. KS: Thanks for the notice on this lens. AM: You are most welcome. Thanks a stack for using our link. KS: It should be great with the 7D M II for hand held use. AM: For sure. 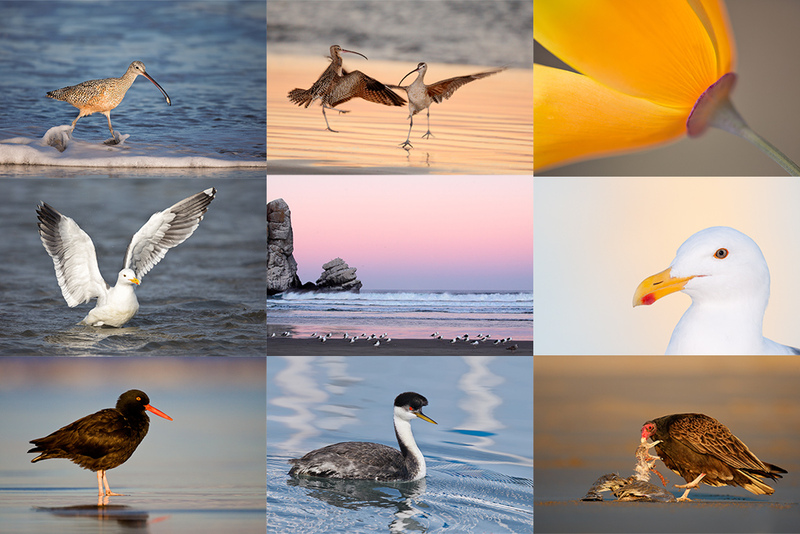 It will open up whole new worlds for beginning bird, wildlife, and nature photographers. KS: Is there any word on IQ with the 1.4xTC? AM: No, but I am sure that in competent hands, as always, that that combo will produce superb images. KS: See you at the Bosque. Is there any word on the bird count there? AM: See you there. The birds have been arriving in good numbers for at least a week. It is hard to express how much I appreciate folks who go out of the way to use my affiliate links to thank me for the work I do here on the blog, for the Bulletins, and for the time I spend answering e-mails. Please remember that using my B&H links will not cost you one penny more; doing so is simply an act of generosity. So thanks! I heard that the lens hood would allow for adjustment of a filter. I’m thinking there might be a groove or space in it for adjusting a polarizer while it is on the camera rather than trying to do that under the hood? I’m hoping I can consider one next year, if reviews are favorable; I would love to add something of this range to my collection if it fits! so will the new 100 to 400 work on the old Mark IV camera? Thanks for the information on how to display both histograms. I could not find it either. I also am trying to get my 7D !! set up the way that I like for things to be. I could not locate the MTF chart on this lens, is it available? I never shared your enthusiasm for the old 100-400. I tried 2 and was very disappointed in each Neither was sharp over 300mm (granted, this was before micro adjustments) All the new Canon lenses have been excellent so I am optimistic about this one. I too wonder if it will replace my lovely 70-200f2.8II with 2x though. Temptation and indecision. Sold my old 1-4 for the new 70-200f2.8 II and 1.4/2.0 TCIII, now what do I do? Thought about getting the 400f2.8 II ($11,000) or the new 1-4 ($2100). Guess I’ll wait an see what the consensus is on the new 1-4 before making any decisions. I read your blog daily and have purchased all your books, e-books, and instructions manuals. These are my photography bibles! I just used both your affiliate links to purchase the new 100-400 and the new lens hood. Many, many thanks. When you have a chance please shoot me your B&H receipt via e-mail to samandmaayasgrandpa@att.net. 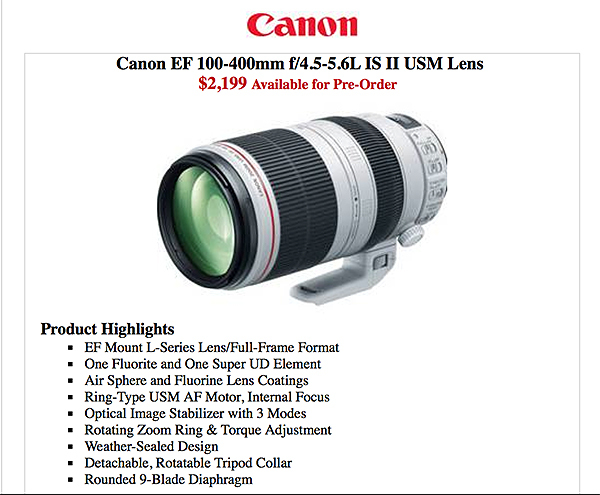 Any news if the new Canon EF 100-400mm f/4.5-5.6L IS II USM Lens is compatible with Canon Extender EF 1.4XIII and EF 2x III? Thanks for the information! Can’t wait for your comments on this lens! Thanks for adding the new 100-400 to the telephoto spec page so quickly. 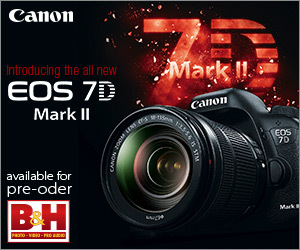 I wonder if B&H will offer the 7D2 and 100-400 2 at a package discount? I would/could replace my older 7D and 100-400 L at the same time if they did. It would help my plan to also eventually replace my old 500 f/4L IS and 1.4x TC II with the newer 500mm f/4L IS II and TC IIIs. I thought of that too but with both products likely to be in huge demand for some time to come I would not be holding my breath….. I believe that sSuch deals are almost always generated by the mfr…. Artie, I believe the separate hood listing is meant for retrofitting to the existing version I lens…that side window allowing polarizer access should have been incorporated years ago! Artie this looks like a very versatile lens to me, I will look into the possibility of ordering one from you because the price in UK is likely to be £2,000. I have read the information and there is mention of “Air Sphere and Fluorine Lens Coatings”, I hope to heck this is a mistake!! Fluorite sounds like a good idea but fluorine,(????) the Health and Safety Executive would have a field day in UK!! Hi, Artie. Well, flourite and flourine probably don’t exist. “Flourite” sounds like a flour derivative! Fluorine is an element that is a gas at room temperature, and not a pleasant one (read highly toxic and very reactive); fluorite is calcium fluoride, a mineral that occurs naturally in crystalline form. Canon makes fluorite synthetically and puts it in (especially telephoto) lenses to reduce chromatic aberration. Thanks for the information on the 100-400 II lens. I wonder if it will make me give up my beloved 400 f/5.6L? It sounds great. I look forward to seeing you and Denise and Kirk Stitt and others at Bosque. There are lots of cranes flying around the Rio Grande valley right now.